Japanese is not like any other language you might have studied before. Many people struggle even to reach a level where they can hold a very basic conversation after having studied it for three or four years. Obviously, it’s not their fault. My name is Luca Toma, and I’m the founder of JapaneseCoaching. As a certified language coach, I help learners of Japanese overcome stumbling blocks along the way to reach faster and more efficient results in the language. I do that through a combination of coaching tools and traditional teaching on a one-to-one basis through Skype. It took me several years to master Japanese, 10 of which spent living in Japan. The reason why it took me so long to master Japanese lies in the fact that it is a very peculiar language. I would not necessarily consider it ‘difficult’, but it definitely is a complex language in terms of aspects to pay attention to (script, word order, registers and styles, politeness). Apart from that, however, my progress in the language would have been much faster if I’d known at the beginning what I now know from experience. 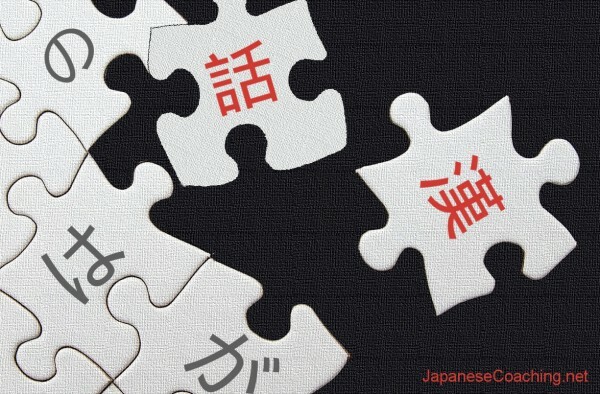 In this post I will point out two crucial mistakes beginner learners of Japanese tend to make. I’ll then suggest what to do to avoid them in order to make steady progress in your Japanese in a matter of months and not years. Some of you might not know it, but the Japanese script is actually a combination of two systems, with three different scripts intertwined. On one hand you have hiragana and katakana, two series of simple characters of 46 symbols each; on the other hand you have hundreds of more complex symbols called kanji (lit. ‘Chinese characters’). Here’s a sample sentence in Japanese. Colors will help you identify the three different scripts (hiragana = green; katakana = brown; kanji = orange). Maria san wa Mirano de hataraite imasu. Demo, sengetsu made Toukyou de hataraite imashita. Maria is working in Milan. However, until last month [she] was working in Tokyo. Both hiragana and katakana are ‘syllabic systems‘ in which each symbol corresponds to a vowel or syllable of the Japanese language. Hiragana is used for particles (in our sample sentence: は wa, a particle indicating the topic of the sentence; で de, ‘in’), inflectional endings of verbs or adjectives (働いて hataraite, ‘work-ing’) or native words not covered by the other two types of script, (でも demo, ‘however’). Katakana is mainly used for loan words (such asマリア Maria, ‘Maria’; ミラノMirano, ‘Milano’). And then we have kanji, which form a ‘logographic system‘ where each symbol corresponds to a block of meaning (働 ‘to work’; 先月 ‘previous + month’ = ‘last month’; 東京 ‘western + capital’ = ‘Tokyo’). A typical mistake beginner learners make is to focus mainly on kanji and learn them individually. This is the exact approach Japanese people have used to learn them in schools and which is also the approach presented to you in most textbooks for learning the language. Learning this way is definitely not a good idea and I’ll tell you why. Some kanji are actually used alone for some words, but the sheer majority of them are used in compounds (i.e. kanji words), meaning that they are part of words. 電 den = ‘electricity’ + 話 wa = ‘to speak’. 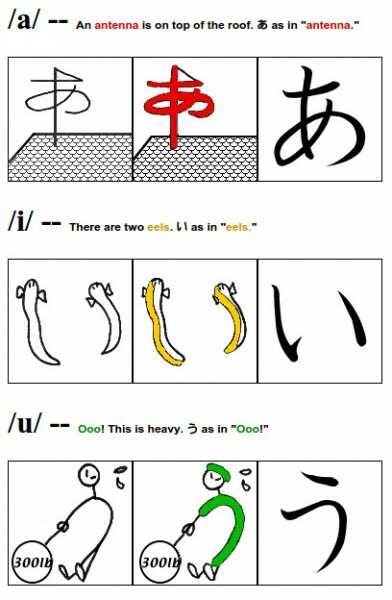 Learning the meanings of these two individual kanji would be like splitting the English word ‘telephone’ into its two components derived from Greek (tele= ‘far’ and phone = ‘sound’), and then learning them individually regardless of the ‘compound word’ they are parts of (i.e. ‘telephone’). If you learn them in this way, you would end up wasting a lot of time! On the other hand, if you learn them not as single entities but as parts of new vocabulary, you will remember them faster and more efficiently. While you keep learning new vocabulary, you will then notice how the same individual kanji are actually used in other compounds too, and their individual meanings will become clearer. See for example the words ‘telegraph’ = 電報 denpou (from 電 den ‘electricity’ + 報 pou ‘information, news’), or ‘train’ = 電 車 densha (from 電 den ‘electricity’ + 車 sha ‘chariot’), etc. The Japanese Ministry of Education has officially announced that the number of kanji for daily use is 2136, and these are learned one by one after having been classified by school year or level in the case of language courses for foreigners. However, the key point here is that the number of kanji you know IS NOT an indicator of how proficient in Japanese you are! Knowing a lot of kanji might be rewarding and useful for understanding written texts, but it does not necessarily help you get fluent in speaking and communicating in the language. This very issue leads us to the next beginners’ mistake I’d like to point out. The other typical mistake beginner Japanese learners make is waiting too long before starting to speak the language (thus failing to get used to its complex syntax!). Japanese is a S-O-V language, meaning that, after the subject (most of the times not even expressed), all the elements in a sentence come before the verb, which usually comes at the end. Getting used to the different word order in Japanese not only takes time and practice, but most of the times direct translation from English does not work at all! I still remember how much I struggled with this aspect of the language when I first set foot in Japan. I would begin a sentence without much effort and get stuck halfway because I didn’t know how to end it. As foreigners, we tend to think of very long and complex sentences in our native tongue and expect to be able to translate them right on the spot. Unfortunately, things don’t work that way with Japanese. So, what are my tips for avoiding these two common mistakes and making progress in Japanese right from the beginning? The first thing you need to do is to learn the two syllabaries: hiragana and katakana. The fastest way to do this is to use mnemonic aids, such as this resource (see picture below), where the shapes and sounds of each Japanese symbol are connected with images and words in English. Once you are able to read the two syllabaries (also known as kana), you then need to get hold of a good book and focus on learning from context. By ‘good book’ I mean a book which has interesting and useful dialogues, a few grammar notes, and an accompanying CD. I usually recommend using Colloquial Japanese. 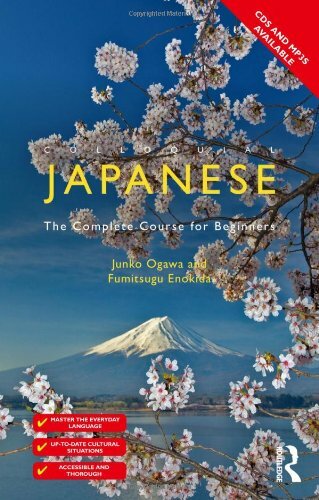 Unlike other textbooks used in Japanese language courses, this resource is conceived to be used by independent learners. It is more concise, grammar is introduced at a faster pace, and dialogues are more suitable for travel situations. The good thing about Colloquial Japanese is that it also teaches you the script, something which is generally neglected in other resources for independent learners. To go through your book, you need to have a study routine which allows you to attack the material from different angles and absorb new grammar and vocabulary effortlessly. Luca’s method of translating texts into your mother tongue (L1) first and again back into the target language (L2) a few days later proved to be a very efficient way to learn Japanese too. Regarding kanji, what I recommend doing is to learn them in context, and by that I mean learning them not as individual entities but as part of the compounds (kanji words) that you encounter in the dialogues of your book. Going back to our sample sentences, you would learn the kanji you find in that particular context. By comparing the Japanese text with the English translation provided in your book, you will not only be learning new vocabulary, but also grammar (働いています hataraite imasu ‘I am working’ as opposed to 働いていました hataraite imashita ‘I was working’). Basically, what helps you learn the kanji is one simple activity: typing. Once you add ‘Japanese’ in the language bar of your Mac or Windows (see this link if you don’t know how to do it), you will just have to open a blank sheet on a word processor, type words in Roman letters (roumaji), and the system will automatically turn each word into their Japanese correspondent script(s). For kanji, you will be given a few options, and you will have to choose the correct one. By doing that, you are basically helping your brain form a link between shapes and sounds (pronunciation). You will remember meanings from context, and even discern the correct characters among those with a similar shape or pronunciation (homophones)! In addition to the input you receive through your textbook, you will also need to devote some time every week to output, and by this I mean ‘speaking practice’. How can I speak if I’m not able to do it yet? Well… regarding the first question, nowadays the Internet offers you plenty of opportunities for finding someone to speak to in the language you’re studying. You can either work with a qualified tutor who can also speak English or do a language exchange with a Japanese native speaker who wants to learn English (there’s plenty of websites for finding one). In this last case, however, it is important that you instruct your exchange partner on how to go about practicing. And this answers your second question about how to start speaking. If you follow a method such as the one I adopt with my students, it is actually possible to hold a conversation in Japanese even from day 1. I call it the ‘block building method‘ and it allows students to start having simple conversations from zero knowledge in the language, with me literally ‘feeding’ them with all the blocks or chunks they need to create sentences and express their ideas during the whole process. Here’s an audio sample from a first session I had with a student a few days ago (you can download a PDF with the script here). If you combine your self-study routine (by using Colloquial Japanese or similar resources) with at least 1 output session with a tutor or exchange partner once per week, you will be astonished at the progress you’ll be making! It is possible to start speaking Japanese in a matter of months and not years if you avoid two of the most common mistakes beginner learners usually tend to make, namely focusing on individual kanji when learning the script and postponing speaking practice. In order to avoid these mistakes, I recommend always learning kanji from context (as parts of vocabulary words as they actually are) and start speaking from day 1 with the help of a qualified language tutor or exchange partner. This is the approach I recommend and proved to be very efficient with most of my students. But obviously, it also depends on how you like to learn and what you like to do. There’s no one-size-fits-all solution in language learning. So, I’m now curious to know what is you experience with learning Japanese. Feel free to share your thoughts on the topic in the comments below! Luca lived in Japan for about 10 years. For a few years, he worked as a Japanese language instructor at various universities in Europe, until he decided to become a certified language coach and teach online. He now helps motivated Japanese learners overcome stumbling blocks and make progress in the language.